Fearless Freedom organic toothpaste from Lebon! Lebon toothpastes are made with selected ethical and natural ingredients combined with delicious and exclusive perfumed natural notes from Grasse – France which are making Lebon Toothpastes so healthy and delicately tasty. They contain Certified Organic Aloe Vera and Green Tea to naturally help protect gums and prevent tooth decay. Lebon Toothpastes are vegan and naturally sweetened with Stevia Rebaudiana. Fearless Freedom: for the intense black current and mint flavor. Use Fearless Freedom toothpaste from Lebon at least two times a day. 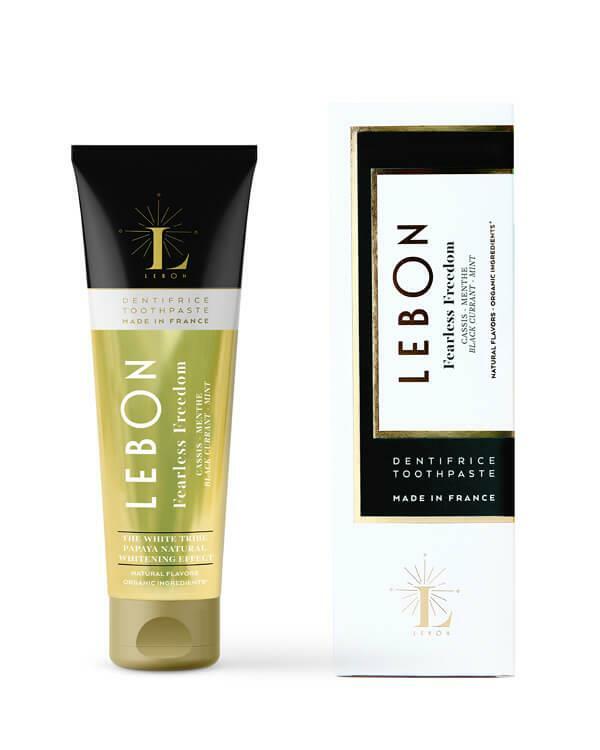 Lebon is a glamorous, luxurious and organic oral care brand from France, that combines biologically certified, natural ingredients with delicious and exclusive scents from Grasse. Each toothpaste contains organic-certified Aloe Vera and Green Tea to ensure healthy teeth and gums. What’s more, they have an endless ‘free from’ list (including fluoride), which is why the Lebon toothpastes are so healthy and tasty!